Charles F. Doran, Sherri Goodman, Katherine Hardin, and Ronald LaBrec discuss climate change and the evolving arctic. Experts discuss U.S. policy priorities for the Arctic. Experts discuss challenges for U.S. national security in the Arctic region. The northern reaches of the planet are melting at a pace few nations can afford to ignore, yielding potentially lucrative returns in energy, minerals, and shipping. 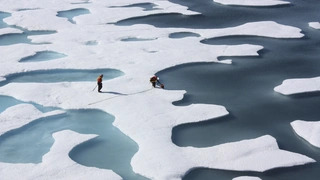 But debate is mounting over whether the Arctic can be developed sustainably and peaceably. This interactive InfoGuide—which includes videos, infographics, maps, and timelines—explores whether the Arctic can be developed sustainably and peaceably. Teaching notes by Lawson Brigham, Distinguished Professor of Geography and Arctic Policy, University of Alaska Fairbanks. Nations are reexamining their interests and capabilities in the Arctic, as climate change in the region presents new economic opportunities and security challenges. As human activity intensifies in the Arctic, U.S. interests would be best represented by a reinforced Coast Guard, exercising the role it carries out in other coastal areas, writes CFR Military Fellow Peter Troedsson.